This plate was made by my Aunt GayeLynn. She made one for each of us as a Christmas gift in 1984. Each of us had a different design. 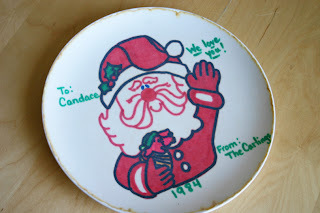 We ate dinner off these plates every night! How many years did we eat off these plates, Mom? Anyway, we loved them & it's something I can never get rid of. Heather, Amber...what was on your plate. For some reason I'm thinking Amber's was a dog, but not sure. Also, this plate jogs memories of those orange & yellow McDonald's plates. They had Ronald McDonald, the Hamburgler & that purple guy, whose name I can't remember. Do you all remember those? I think everybody had them. Fry Guy? HOW do you have that??? And where are ours Mom? In the deep, dark crawl space? Or maybe in the landfill somewhere. I think that mine had a stocking of some sort. I love that you still have that and wish I knew where mine was. Does bring back good memories. Oh man, I totally thought I had already stolen the McDonalds plate from my parents' house (Bryan & I would FIGHT over that sonuva). Imagine my surprise when I found it wasn't in our cupboard. Oh well, I guess I'll have to put it on my list of things to do next time we're in Sin City, right above "Give Oscar Goodman a wedgie," but below "Drop a penny off of the Stratosphere," and "Hunt down Count Cool Rider and put a stake in his undead heart." Oh, and Heather, if it IS in the crawlspace... just let it go. It's not worth facing whatever dwells down there for a plate. Seriously, it's scary down there. I think I saw a half-scorpion, half-cockroach eating a baby unicorn down there that time we went down there for the Christmas decorations. The purple guy is the hamburgular. Right? Yeah mom where are our plates? I loved those. We ate on them every night. I thought mine was a reindeer? Not sure. That does bring back some good memories!